An iron meteorite fell on the Sikhote-Alin Mountains, in southeastern Russia, in 1947. Though large iron meteorite falls had been witnessed previously and fragments recovered, never before in recorded history had a fall of this magnitude been observed. An estimated 23 tonnes  of fragments survived the fiery passage through the atmosphere and reached the Earth, but still less than the largest meteorite find, the Hoba meteorite of 60 tonnes. 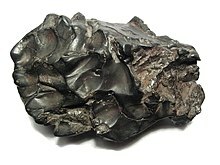 Iron meteorites are meteorites that consist overwhelmingly of an iron–nickel alloy known as meteoric iron that usually consists of two mineral phases: kamacite and taenite. 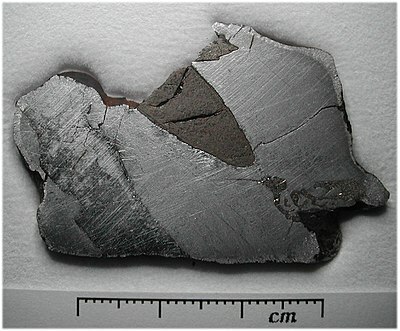 Iron meteorites originate from cores of planetesimals. The tonne, commonly referred to as the metric ton in the United States and Canada, is a non-SI metric unit of mass equal to 1,000 kilograms or one megagram. It is equivalent to approximately 2,204.6 pounds, 1.102 short tons (US) or 0.984 long tons (UK). Although not part of the SI, the tonne is accepted for use with SI units and prefixes by the International Committee for Weights and Measures. At around 10:30 on 12 February 1947, eyewitnesses in the Sikhote-Alin Mountains, Primorye, Soviet Union, observed a large bolide brighter than the sun that came out of the north and descended at an angle of about 41 degrees. The bright flash and the deafening sound of the fall were observed for 300 kilometres (190 mi) around the point of impact not far from Luchegorsk and approximately 440 km (270 mi) northeast of Vladivostok. A smoke trail, estimated at 32 km (20 mi) long, remained in the sky for several hours. A bolide is an extremely bright meteor, especially one that explodes in the atmosphere. In astronomy, it refers to a fireball about as bright as the full moon, and it is generally considered a synonym for a fireball. In geology, a bolide is a very large impactor. As the meteor, traveling at a speed of about 14 km/s (8.7 mi/s), entered the atmosphere, it began to break apart, and the fragments fell together. At an altitude of about 5.6 km (3.5 mi), the largest mass apparently broke up in a violent explosion called an air burst. An air burst or airburst is the detonation of an explosive device such as an anti-personnel artillery shell or a nuclear weapon in the air instead of on contact with the ground or target or a delayed armor-piercing explosion. The principal military advantage of an air burst over a ground burst is that the energy from the explosion is distributed more evenly over a wider area; however, the peak energy is lower at ground zero. Because the meteor fell during daytime, it was observed by many eyewitnesses. Evaluation of this observational data allowed V. G. Fesenkov, then chairman of the meteorite committee of the USSR Academy of Science, to estimate the meteoroid's orbit before it encountered the Earth. This orbit was ellipse-shaped, with its point of greatest distance from the sun situated within the asteroid belt, similar to many other small bodies crossing the orbit of the Earth. Such an orbit was probably created by collisions within the asteroid belt. The Russian Academy of Sciences consists of the national academy of Russia; a network of scientific research institutes from across the Russian Federation; and additional scientific and social units such as libraries, publishing units, and hospitals. In physics, an orbit is the gravitationally curved trajectory of an object, such as the trajectory of a planet around a star or a natural satellite around a planet. Normally, orbit refers to a regularly repeating trajectory, although it may also refer to a non-repeating trajectory. To a close approximation, planets and satellites follow elliptic orbits, with the central mass being orbited at a focal point of the ellipse, as described by Kepler's laws of planetary motion. Krinov had estimated the post-atmospheric mass of the meteoroid at some 23,000 kg (51,000 lb). The strewn field for this meteorite covered an elliptical area of about 1.3 km2 (0.50 sq mi). Some of the fragments made impact craters, the largest of which was about 26 m (85 ft) across and 6 m (20 ft) deep. Fragments of the meteorite were also driven into the surrounding trees. The first type probably broke off the main object early in the descent. These pieces are characterized by regmaglypts (cavities resembling thumb prints) in the surface of each specimen. The second type are fragments which were either torn apart during the atmospheric explosions or blasted apart upon impact on the frozen ground. Most were probably the result of the explosion at 5.6 km (3.5 mi) altitude. A large specimen is on display in Moscow. Many other specimens are held by Russian Academy of Science and a great number of smaller specimens have made their way into the collector's market. 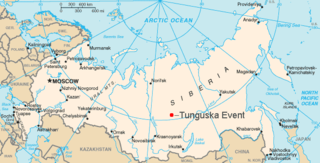 The Tunguska event was a large explosion that occurred near the Stony Tunguska River in Yeniseysk Governorate, Russia, on the morning of 30 June 1908 (NS). The explosion over the sparsely populated Eastern Siberian Taiga flattened 2,000 square kilometres of forest, yet caused no known human casualties. The explosion is generally attributed to the air burst of a meteor. 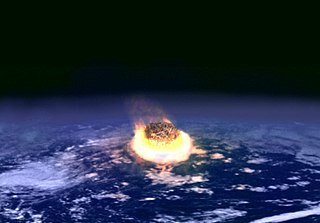 It is classified as an impact event, even though no impact crater has been found; the object is thought to have disintegrated at an altitude of 5 to 10 kilometres rather than to have hit the surface of the Earth. An impact event is a collision between astronomical objects causing measurable effects. 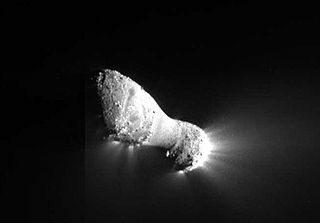 Impact events have physical consequences and have been found to regularly occur in planetary systems, though the most frequent involve asteroids, comets or meteoroids and have minimal effect. When large objects impact terrestrial planets such as the Earth, there can be significant physical and biospheric consequences, though atmospheres mitigate many surface impacts through atmospheric entry. Impact craters and structures are dominant landforms on many of the Solar System's solid objects and present the strongest empirical evidence for their frequency and scale. The Campo del Cielo refers to a group of iron meteorites or to the area where they were found. This area is situated on the border between the provinces of Chaco and Santiago del Estero, 1,000 kilometers (620 mi) northwest of Buenos Aires, Argentina. The crater field covers an area of 3 by 18.5 kilometres and contains at least 26 craters, the largest being 115 by 91 metres. The pallasites are a class of stony–iron meteorite. The Great Daylight Fireball was an Earth-grazing fireball that passed within 57 kilometres of Earth's surface at 20:29 UTC on August 10, 1972. It entered Earth's atmosphere at a speed of 15 kilometres per second (9.3 mi/s) in daylight over Utah, United States and passed northwards leaving the atmosphere over Alberta, Canada. It was seen by many people and recorded on film and by space-borne sensors. An eyewitness to the event, located in Missoula, Montana, saw the object pass directly overhead and heard a double sonic boom. The smoke trail lingered in the atmosphere for several minutes. Pultusk is an H5 ordinary chondrite meteorite which fell on 30 January 1868 in Poland. The event has been known as the stony meteorite shower with the largest number of pieces yet recorded in history. Made up of rocky debris, it consists of pyroxene or olivine chondrules deployed in mass plagioclase, there being also kamacite. Buzzard Coulee is the collective name of the meteorites fallen on November 20, 2008 over Saskatchewan, Canada. Neuschwanstein was an enstatite chondrite meteorite that fell to Earth on 6 April 2002 at 22:20:18 GMT near Neuschwanstein Castle, Bavaria, at the Germany–Austria border. The Sutter's Mill meteorite is a carbonaceous chondrite which entered the Earth's atmosphere and broke up at about 07:51 Pacific time on April 22, 2012, with fragments landing in the United States. The name comes from the Sutter's Mill, a California Gold Rush site, near which some pieces were recovered. Meteor astronomer Peter Jenniskens assigned SM numbers to each meteorite, with the documented find location preserving information about where a given meteorite was located in the impacting meteoroid. As of May 2014, 79 fragments had been publicly documented with a find location. The largest (SM53) weighs 205 grams (7.2 oz), and the second largest (SM50) weighs 42 grams (1.5 oz). The Chelyabinsk meteor was a superbolide that entered Earth's atmosphere over Russia on 15 February 2013 at about 09:20 YEKT. It was caused by an approximately 20 m (66 ft) near-Earth asteroid with a speed of 19.16 ± 0.15 kilometres per second. It quickly became a brilliant superbolide meteor over the southern Ural region. 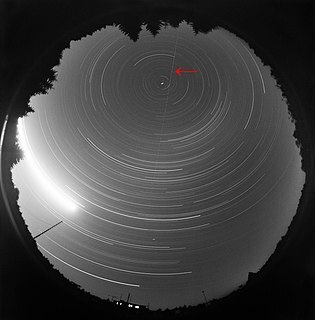 The light from the meteor was brighter than the Sun, visible up to 100 km (62 mi) away. It was observed over a wide area of the region and in neighbouring republics. Some eyewitnesses also felt intense heat from the fireball. The Chelyabinsk meteorite is the fragmented remains of the large Chelyabinsk meteor of 15 February 2013 which reached the ground after the meteor's passage through the atmosphere. The descent of the meteor, visible as a brilliant superbolide in the morning sky, caused a series of shock waves that shattered windows, damaged approximately 7,200 buildings and left 1,500 people injured. The resulting fragments were scattered over a wide area. On 13 October 1990, meteoroid EN131090, with an estimated mass of 44 kg, entered the Earth's atmosphere above Czechoslovakia and Poland and, after a few seconds, returned to space. Observations of such events are quite rare; this was the second recorded using scientific astronomical instruments and the first recorded from two distant positions, which enabled the calculation of several of its orbital characteristics. The encounter with Earth significantly changed its orbit and, to a smaller extent, some of its physical properties. 2018 LA, also known as ZLAF9B2, was a small Apollo near-Earth asteroid approximately 2.6–3.8 m (9–12 ft) in diameter that impacted Earth at roughly 16:44 UTC on 2 June 2018 near the border of Botswana and South Africa. It was discovered only 8 hours prior by the Mount Lemmon Survey, and based on an hour and a half of observations, it was calculated to have a roughly 85% chance of impacting Earth, likely somewhere between Australia and Madagascar. 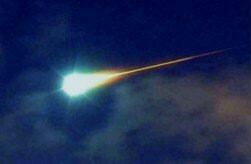 Hours later, a report arrived to the American Meteor Society that an observer from Botswana had seen a bright fireball. After the impact, the Asteroid Terrestrial-impact Last Alert System (ATLAS) released observations roughly 2 hours after the other reported observations which confirmed that the asteroid had indeed impacted Earth on a grazing path and near the location of the fireball. A preliminary analysis of the pre-impact evolution of this meteoroid suggests that it may be part of a dynamical grouping. 1 2 3 Meteoritical Bulletin Database: Sikhote-Alin. Archived from the original on 2012-01-30. ↑ Norton, O. Richard (1998). Rocks From Space. Missoula, Montana: Mountain Press. p. 103. ISBN 0878423028. ↑ Burns, Philip R. "Pib". 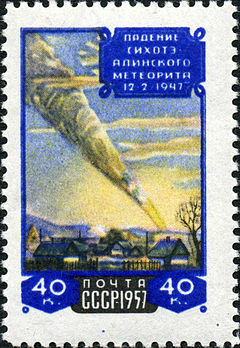 "Meteorite Stamps and Coins". Archived from the original on 2000-01-21. ↑ "Sikhote Alin". Planetarium de Montreal. Archived from the original on 2006-05-21. ↑ Norton, O. Richard; Chitwood, Lawrence A. (2008). Field Guide to Meteors and Meteorites. London: Springer-Verlag. p. 47. ISBN 9781848001572. 1 2 Gallant, Roy (February 1996). "Sikhote-Alin Revisited". Meteorite Magazine. Arkansas Center for Space and Planetary Sciences, University of Arkansas. Archived from the original on 2010-06-12. ↑ Buchwald, Vagn F. (1975). HANDBOOK OF IRON METEORITES Their History, Distribution, Composition and Structure. https://evols.library.manoa.hawaii.edu/handle/10524/36040: University of California Press. pp. Vol 3, Pages 1123–1130. Group lIB. 5.90% Ni, 0.42% Co, 0.46% P, 0.28% S, 52 ppm Ga, 161 ppm Ge , 0.03 ppm Jr.
Wikimedia Commons has media related to Sikhote-Alin meteorite . "Exposition "Meteorites"". Fersman Mineralogical Museum. Moscow, Russia: Russian Academy of Sciences. Archived from the original on 1999-04-20.